I hope Saturday Night Live gets Tina Fey to come on tonight and play Sarah Palin doing a book interview (perhaps with Katie Couric). Really, Would We Have Expected Anything Else From Sarah? Sarah Palin’s book, Going Rouge is coming out. Look for it in the fiction section of your local book store. Considering how many of my posts on Sarah Palin are devoted to debunking the falsehoods she states, did anyone really expect to see any honesty in her book? THE FACTS: Although travel records indicate she usually opted for less-pricey hotels while governor, Palin and daughter Bristol stayed five days and four nights at the $707.29-per-night Essex House luxury hotel (robes and slippers come standard) overlooking New York City’s Central Park for a five-hour women’s leadership conference in October 2007. With air fare, the cost to Alaska was well over $3,000. Event organizers said Palin asked if she could bring her daughter. The governor billed her state more than $20,000 for her children’s travel, including to events where they had not been invited, and in some cases later amended expense reports to specify that they had been on official business. She accepted $1,000 each from a state senator and his wife in the weeks after the two Republican lawmakers’ offices were raided by the FBI as part of an investigation into a powerful Alaska oilfield services company. After AP reported those donations during the presidential campaign, she said she would give a comparative sum to charity after the general election in 2010, a date set by state election laws. THE FACTS: Palin is blurring the lines between Obama’s stimulus plan — a $787 billion package of tax cuts, state aid, social programs and government contracts — and the federal bailout that Republican presidential candidate John McCain voted for and President George W. Bush signed. PALIN: She says her team overseeing the development of a natural gas pipeline set up an open, competitive bidding process that allowed any company to compete for the right to build a 1,715-mile pipeline to bring natural gas from Alaska to the Lower 48. THE FACTS: Palin characterized the pipeline deal the same way before an AP investigation found her team crafted terms that favored only a few independent pipeline companies and ultimately benefited a company with ties to her administration, TransCanada Corp. Despite promises and legal guidance not to talk directly with potential bidders during the process, Palin had meetings or phone calls with nearly every major candidate, including TransCanada. PALIN: Criticizes an aide to her predecessor, Gov. Frank Murkowski, for a conflict of interest because the aide represented the state in negotiations over a gas pipeline and then left to work as a handsomely paid lobbyist for ExxonMobil. Palin asserts her administration ended all such arrangements, shoving a wedge in the revolving door between special interests and the state capital. THE FACTS: Palin ignores her own ”revolving door” issue in office; the leader of her own pipeline team was a former lobbyist for a subsidiary of TransCanada, the company that ended up winning the rights to build the pipeline. PALIN: Writes about a city councilman in Wasilla, Alaska, who owned a garbage truck company and tried to push through an ordinance requiring residents of new subdivisions to pay for trash removal instead of taking it to the dump for free — this to illustrate conflicts of interest she stood against as a public servant. THE FACTS: As Wasilla mayor, Palin pressed for a special zoning exception so she could sell her family’s $327,000 house, then did not keep a promise to remove a potential fire hazard on the property. She asked the city council to loosen rules for snow machine races when she and her husband owned a snow machine store, and cast a tie-breaking vote to exempt taxes on aircraft when her father-in-law owned one. But she stepped away from the table in 1997 when the council considered a grant for the Iron Dog snow machine race in which her husband competes. THE FACTS: She correctly quotes a comment attributed to Obama in January 2008, when he told San Francisco Chronicle editors that under his cap-and-trade climate proposal, ”electricity rates would necessarily skyrocket” as utilities are forced to retrofit coal burning power plants to reduce carbon dioxide emissions. Obama has argued since then that climate legislation can blunt the cost to consumers. Democratic legislation now before Congress calls for a variety of measures aimed at mitigating consumer costs. Several studies predict average household costs probably would be $100 to $145 a year. PALIN: Welcomes last year’s Supreme Court decision deciding punitive damages for victims of the nation’s largest oil spill tragedy, the Exxon Valdez disaster, stating it had taken 20 years to achieve victory. As governor, she says, she’d had the state argue in favor of the victims, and she says the court’s ruling went ”in favor of the people.” Finally, she writes, Alaskans could recover some of their losses. PALIN: Describing her resistance to federal stimulus money, Palin describes Alaska as a practical, libertarian haven of independent Americans who don’t want ”help” from government busybodies. THE FACTS: Alaska is also one of the states most dependent on federal subsidies, receiving much more assistance from Washington than it pays in federal taxes. A study for the nonpartisan Tax Foundation found that in 2005, the state received $1.84 for every dollar it sent to Washington. PALIN: Says she tried to talk about national security and energy independence in her interview with Vogue magazine but the interviewer wanted her to pivot from hydropower to high fashion. PALIN: ”Was it ambition? I didn’t think so. 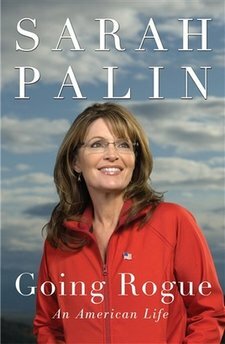 Ambition drives; purpose beckons.” Throughout the book, Palin cites altruistic reasons for running for office, and for leaving early as Alaska governor. THE FACTS: Few politicians own up to wanting high office for the power and prestige of it, and in this respect, Palin fits the conventional mold. But ”Going Rogue” has all the characteristics of a pre-campaign manifesto, the requisite autobiography of the future candidate.